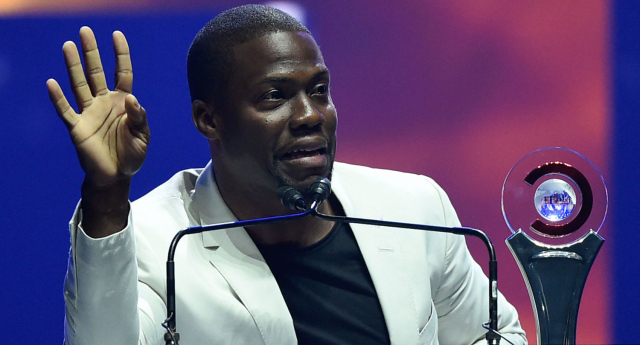 Comedian Kevin Hart has addressed a controversial ‘joke’ about not wanting a gay son. The comedian made the ‘joke’ during his 2010 Seriously tour – when he joked: “One of my biggest fears is my son growing up and being gay. That’s a fear. He spoke to Rolling Stone magazine about the backlash to the ‘joke’. He said: “It’s about my fear. I’m thinking about what I did as a dad, did I do something wrong, and if I did, what was it? Not that I’m not gonna love my son or think about him any differently. “The funny thing within that joke is it’s me getting mad at my son because of my own insecurities — I panicked. It has nothing to do with him, it’s about me. “That’s the difference between bringing a joke across that’s well thought-out and saying something just to ruffle feathers. Kevin Hart said in January that he would refuse to play a gay character, and had turned down a role in Tropic Thunder because it involved homosexuality. He said: “I feel I can’t [play a gay character] because I don’t think I’m really going to dive into that role 100 percent, because of the insecurities about myself trying to play that part.